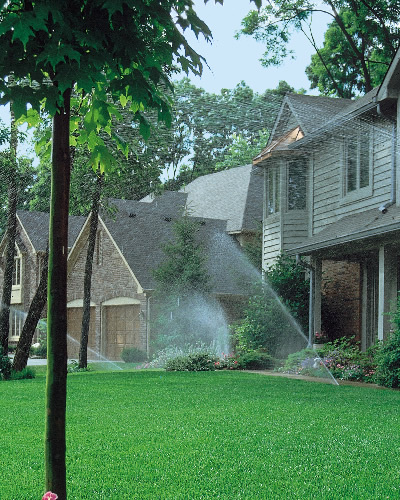 What if there were ways for you to use less water on your lawn without negatively affecting it? What if using less water actually made your lawn more healthy? Here are some ways to accomplish just that. If you have one of the old controllers with wheels and push pins, you should look at the new computerized controllers. You will have far more control and flexibility in your programming giving you many opportunities to save water. For those of you who still have the impact rotors (the head that makes the Tst Tst Tst sound), the newer gear driven rotors save water and need far less frequent adjusting and cleaning. Pieces of mulch and grass roots will not stop them from rotating. One area of irrigation which has been a big water waster for a very long time is the small radius spray type heads (they spray like a mist and don’t rotate). These heads put down too much water too fast and very unevenly. Our new stream rotors are an inexpensive and easy solution to this. How would you like it if your soil could tell you when it was dry enough to require it’s next watering? Well, it can, with a soil moisture sensor. We set the sensor for how dry we want the soil to get before watering again and the sprinklers won’t run until that point. No more guessing. We now have controllers with weather stations. These controllers are programmed for your specific zip code. When combined with the weather station, they continually monitor your rainfall and temperatures. The controller then takes all of this information and decides whether the system will water and for how long.